Getting Press for our company Part 4 – Success story #2 – The Cover of Access Lift & Handlers Magazine. It’s crazy just how the world works sometime. We had just gotten our stuff to Vince at Scaffold Industry Magazine and the article hadn’t even come out yet when someone in our office remembered being contacted by Lindsey Anderson over at Access Lift & Handlers Magazine (part of KHL group). Again, we turned her name over the Erik who told her about the work we were doing over at Independence Hall. She was excited when she saw the images. She even thought that we would get the cover shot of the magazine. Yeah! So, we went back to the press release and tweaked it a bit so it wasn’t the exact same as the one we sent to scaffold magazine. By the way, I did inform her that we had already had an article coming out in the other periodical – it’s just good business to be honest about where you stuff is being seen. She assured us that there were no worries. We went back and forth a few times as Lindsey prepared the article and layout… She was very cool and professional throughout the entire process. And a few weeks later… Bam. 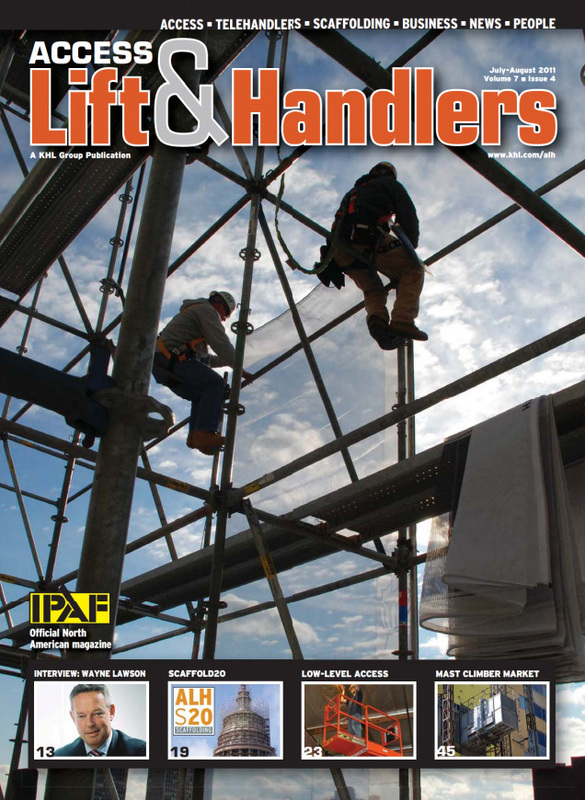 The cover of Access Lift & Handlers Magazine. The article inside was great and we had accomplished our goal. See the article inside – here. A giant shout out to both Lindsey over and Access Lift & Handlers Magazine, and Vince at Scaffold Industry Magazine for the work they did on the Independence Hall project. We thought that this worked so well that we are now making this part of our over-all marketing strategy. Posted on August 22, 2011, in News & Updates and tagged Advertising, article, Atlantic City, Declaration of Independence, Donald Trump, frame scaffold, Independence Hall, magazine, Marketing, photos, pics, PR, Press, rentals, Safety, sales, scaffold, scaffolding, superior scaffold, Suspended, System. Bookmark the permalink. Leave a comment.